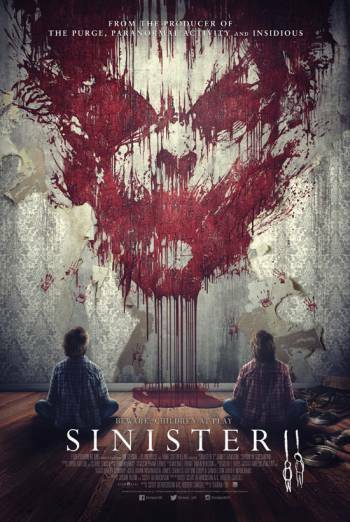 SINISTER 2 is a horror film about an evil spirit who manipulates children into killing their families. A character watches home videos of violent murders that took place in his house; whilst watching these videos, families are seen being eaten by animals, electrocuted, burnt and tortured. The violence is strong, but there is no focus on the violence, nor any strong gory images. A man is punched in the face, with strong bloody impact detail, and a character has some of their fingers cut off. There are frequent scenes of strong sustained threat in which characters are pursued by supernatural spirits. A family is terrorised by a character who chases them through their house, intent on killing them. There are also implied scenes of domestic abuse. There is a single directed use of very strong language ('c**t'), as well as frequent uses of strong language ('f**k').